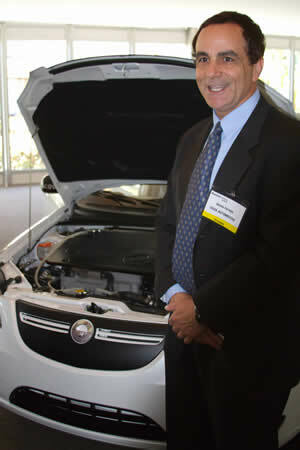 Plug-In Electric Vehicle Infrastructures USA 2011 was held March 31 and April 1 2011 in San Diego. An international gathering of over 125 participants spent two days discussing the state of the industry as well as the nuances critical to capitalize on the initial momentum of Plug-in vehicles enjoy. The event was capably produced by the British firm FC Business Intelligence who have two more EV specific events scheduled for this year. The event was hosted by John Gartner and Dave Hurst of Pike Research, who proclaimed at the kickoff that “2011 would be the year it all comes together” and the parade of speakers that followed certainly echoed their enthusiasm. However within the details there emerged some issues, especially around worldwide plug in standards and the integrated value chain communication that need to be explored and resolved. Veerebder Kauk from Frost and Sullivan highlighted the emerging EV landscape. The firm projects global sales of all types of EV’s, including fleet and municipal purchases will reach 1.2M units by 2015. He reported that 62 companies have announced production of 124 vehicles with 94% of those from traditional automakers. Initial market preference is for Hybrid Electric Vehicles (HEV’s) rather than pure battery vehicles (BEV’s). People are buying EV’s because they are the “latest and greatest” and have environmental benefits. Purchasers are mostly males 36-45 who already own a luxury vehicle. Interest in HEV’s is initially driven by perceived “range anxiety” of pure BEV’s, however speaker after speaker posed that range anxiety is an emotional projection rather than a reality. Most American drivers average less than 60 miles driving in a day which is well within the range of most BV’s. Mark Perry, Director for Advanced technology at Nissan even went so far as to proclaim, ”range anxiety disappears in 7 days; drive one and it goes away”. Frost and Sullivan reports that 50% of consumer would prefer a vehicle with 4 hr charge time and believes a 100 mile charge will be the sweet spot for consumers. Consumers also desire the battery have a “fuel” gauge and real time information so they know how far it is to the next charging station and what the rate is for a charge. There is a false perception that market entry is easy for new automakers as the management and support of a dealer, sales and support infrastructure still is a defining business issue. Fleet purchases may be an initial market driver, especially those organizations with fixed routes such as post office, business delivery services and telecommunications. In fact GE has committed to purchasing 25,000 EV’s by 2015 for it’s corporate fleet. The second day kickoff was presented by Oliver Hazimeh, Director and EMobility Practice Lead, for PRTM. The presentation was notable for its long term perspective and value chain mapping. Oliver had significant enthusiasm for “not if this is going to happen but how fast” and spent time detailing their perspective on the massive value chain shift, a new ecosystem and opportunities beyond chargers. They estimate that 10% of all vehicles worldwide with be electric by 2020 and a $250B global market will be created. Fleets have a real role in early market development; in fact the Obama administration just announced a “Clean Fleet Initiative”. While he noticed that supply and demand are starting to be in synch, he mentioned some potential barriers to adoption include the battery to cost performance ratios, the deployment of appropriate infrastructure, the affordability of EV’s vehicles, and general consumer acceptance. One area of concern he noted was the ongoing requirements for data integration between car telematic systems, car owners and subscribers and the charging network. Also there is the consideration of how will the end-to-end ecosystems and system integration function after the government ends financial incentives to assist in technical integration and basic deployment. A recent survey of drivers by PRTM indicated that home charges will account for 50% of charging needs, with private/workplace providing another 30% and the final 20% will be in public environments. Given the high cost of public DC chargers he felt there was not a long term business ROI and advocated the development of Infrastructure plus services models. Finally, he reminded the audience that very significant deployment is occurring globally and stated “China is going big in to EV” and that would eventually have ramifications for the scale of the industry. A significant player in the EV infrastructure environment are utilities, which were amply represented at the conference. Michael Pesin, Chief Technology Advisor at Seattle City Light articulated the utilities major concerns, a) how do we know where the EV’s vehicles are located and being charged so we can plan for energy distribution and not have transformers blow when there are multiple cars in a neighborhood as well as plan for potentially massive loads with emerging Level 3 fast DC chargers b) can we match the need and desire for renewable energy with the charging of vehicles and c) how can we enable smart charging infrastructure so that charging is done off peak hours and at appropriate Time of Use (TOU) pricing. Chris Chen, Market Development Manager of San Diego Gas and Electric said it well when he stated, “consumers don’t want to have to think about managing energy”. Utilities have benefited from public policy and government funding of programs to encourage and build out public charging infrastructure as well as smart grid initiatives. A panel with representatives from Seattle, Portland and San Diego provided details of over 4,700 public chargers being deployed. In a session moderated by Mike Calise of EVadvise the stakeholders who have helped prepare San Diego’s EV infrastrucutre discussed the multiyear collaborative process to deploy over 1,000 ECOtality chargers in readiness for the launch of the Nisan Leaf. Ray Hobbs of ECOtality took the 90,000 foot view and said for drivers, for any city or community to get involved in EV requires “understanding the real need for sustainability as essential and energy security, using national resources rather than global oil would create economic and national security”. Joel Pointon, Electric Transportation Manager for San Diego Gas and Electric described the challenges in getting local communities involved in early planning and decision-making. As California is a “local state” each community must make it’s own rules about EV infrastructure. Joel shared a significant lesson learned; the local municipalities do not have enough inspectors to inspect all of the residential chargers being installed. Over 400 PEV’s are expected to be delivered to the San Diego area in April 2011 which requires 400 residential inspections for newly installed electric chargers and the cities cannot handle the workload. Many cities are now looking at how to streamline that process possibly through the use of dedicated deputy inspectors. The collaborators all stressed that this is a new value proposition and knowing what the consumers value is critical. Not just when and where to charge but what services might want. The utilities are carefully watching this deployment to see how the cars affect the grid and to prevent neighborhood transformer overload. Nissan, Toyota, CODA and BWM all had representatives make presentations at the event. Generally they are all very excited about the moving from pilot programs and into scalable mass-market launches. Nissan is committed to factory output of 500,000 cars a year. The long-term issue is can the scale of manufacturing and sales the cars be increased so that when tax incentives for purchase and deployment go away the cost of the vehicles is decreased. All the automakers were optimistic that that would happen. When asked about the demand from consumers Nissian stated that they had 350,000 people raise their virtual hands saying they wanted a car nationwide, with over 20,000 confirmed reservations. The number one consumer driver for purchase was dollars and cents, the potential cost savings of electricity over oil and the decreased maintenance costs for the vehicle. Following that was concern for the environment, reducing carbon emissions and national energy security. The automakers believe that EV is not the choice for a first car, but most likely the second car. Data shows that consumers are charging overnight at home in most cases and charging at work if possible. Putting in a 240v home filing station is initially expensive the manufacturers believe that that is the most likely scenario for a majority of users. Nissan visualized charging infrastructure as a pyramid, with home chargers the base, work chargers as the middle and public charging infrastructure at the top. The emerging DC “fast charging stations” (80% full in 20 minutes) will eventually service the needs for the “top off” mentality as well as the primary needs for owners in apartment buildings and city owners without a garage. All vehicle types have their place in the emerging market and Perry said that BEV’s are seen as the “bridge to zero emissions” and as such will eventually overtake plug-in hybrids which still have an internal combustion engine as a part of the power train. Rich Steinberg of BMW stated that their EV strategy is to create a new brand for their ActiveE to be launched in 2011 and they will build an EV power train in-house for use in their i3 and i8 EV models due to be launched in 2013. One area of concern for automakers and consumers is the need for EV plug standards. According to Jack Pokrzywa of the Society of Automotive Engineers (SAE) “It’s not the standards, it’s global politics”. The recently released J1772 has been accepted in the US and EU and the differences between US and EU voltages and communications have been addressed. However China and Japan had different power infrastructures and are considering different plugs and communication standards for their environments. Given the significant adoption of EV’s in those markets and the cachet of setting a worldwide standard work still needs to be done to harmonize nuances between geographies. In addition standards for the newer DC fast chargers are yet to be agreed upon. In the near term a lack of standards will not affect consumers ability to universally charge their cars, however in the long term there may be situations that require EV plug converters such as those travelers use. It was impressive how much energy is going into setting the standards and without a doubt there will be resolution that satisfies all parties. Gustavo Collantes from Washington State Department of Commerce discussed the I5 corridor in Washington. The loop goes from Seattle to Lake Wenatchee, a popular resort destination about 100 miles from Seattle. The project is designed to bring public and private organizations together to demonstrate the value of DC charging. Chris Chen, wearing a private company hat, (Juice Technologies) discussed the concept that 240v is not necessary for most consumers. He challenged the audience to consider the public infrastructure as a safety blanket that will take a significant amount of time and stakeholders to accomplish. The issue from a billing standpoint is “are we metering the car itself or the plug in the wall and the charger”. Richard Lowenthal, CEO of Colulomb Technology followed up by saying that plug-in hybrid owners charge twice as often as BEV drivers because PEV want to stay on batteries so they are always charging. BEV’s have larger batteries that are capable for round trip commuting. He also stated that he believed 2 million chargers would be installed worldwide by 2015. His company believes that the real business opportunity for public access charging owners and operators is to deliver driver services, such as reserving a space at a charging station, the real-time location of open charging stations, and authentication and real-time status of car charging. Obviously there are other driver services that can be enabled and marketed due to the time value of the car owner at the charging location. Currently Colulomb splits revenue with the service station 93/7, with the larger portion for the service station operator. A different spin on charging came from Mariana Gerzanych CEO and Tim Maason, President of 350Green. They own and operate a network of charging stations. Currently they have sourced DC technology and are deploying fast chargers in shopping malls, grocery stores and parking lots. One of their projects in conjunction with the city of Chicago will deploy 280 charging stations and the project was funded by a $1.9M contract from Chicago. They negotiate license agreements with the host locations and pay them a % of revenue. Average time a car is parked is 26 minutes and a L2 charger can give 6 miles in 20 minutes, a DC charger 80 miles. John Horn of T-Mobile presented a session on seamless connectivity. He discussed how the combination of devices, apps and connectivity could be the “killer app” for the EV owner, who may desire savings and convenience by having the car chose the lowest cost timeframe to recharge itself. The machine to machine integration required to connect the grid, the car and the charger into a service based network requires significant machine to machine integration between multiple stakeholders. The technical challenge is exacerbated by the different timeframes partners have for infrastructure investments as utilities generally make infrastructure investments with a 20 year perspective, the automakers timeframe is 10 years and telecommunications companies refresh infrastructures almost every 6 months. All parties are working diligently to understand the needs, drivers and requirements of their new partners. European telematics and wireless communication provider Telenor was represented by Per Linberg who spoke about how everything is going “smart”, smart transportation, smart cities, smart grids and how to give the user, via a smart phone, the “remote control” of how and when to charge the vehicle. He suggested we are at the early stages of the connectivity models and that “we are now trying to find the right way to provide information and services in this fundamentally changing transportation market”. Again he emphasized the ongoing integration between automobile OEM’s, the utilities, the fleet operators, the drivers of EV’s, insurance and financial organizations and road and traffic information are required to seamlessly connect to provide the consumer with a simplified view into the EV environment. He reminded the audience that in Europe drivers may be crossing national boundaries and to sort out the billing and roaming charges would be required so consumers don’t suffer from bill shock. One of the key takeaways from the event was that a lot of consumer education is required to continue the momentum of early adopters and to help cross over to a more mainstream market mid-century. EV ownership will require increased awareness about energy, not power, a new vehicle power train, batteries and conversion from miles per gallon to miles per kWt hour. By installing a home charger consumers are really putting a gas pump in their garage. Yet we know that consumers don’t want to think about how to manage energy and so this whole new idea for the consumer; now they have to know about managing energy systems, requires a behavioral change, driven by education and simplified solutions for mass adoption. For example consumers must examine in detail their driving habits and energy usage to determine if 110v home charging is enough for their needs, prior to investing in 240V charger in order to receive TOU benefits As the industry evolves we can only hope that EV’s may be the first smart appliance for the smart grid and consumers will begin to watch and monitor their energy consumption with passion. The elephant in the room, especially given the recent events in Japan, is the answer to how do we get the energy? Many types of energy were mentioned including clean coal, nuclear, natural gas and renewable such as hydro, solar and wind. Everyone agreed that we are not just morphing our energy requirements from tailpipe to smokestack as the current projection of EV’s usage can easily be handled by the power available today on the grid. However, the greater use of renewable energy and the tighter integration of those energy sources into the smart grid so that EV owners can purchase energy from those fuels would be an ongoing challenge and one well worth undertaking.